It was a Saturday morning and the sea was angry. I wasn’t even supposed to be swimming today…it was supposed to be the first day of my advanced dive training, but the weather was so bad they pushed that back! So apparently, if the weather is too bad to dive, you go swimming instead! It was slightly better than last week – less stinging rain, for a start. We did a similar training session…swimming the channel from the Bondi flags to the new North Bondi Tower (pictured below on a better day a couple of weeks ago). Not in any way indicative of the conditions on the day of training! It was tough, but as usual on rough days it was actually a lot of fun and nowhere near as bad as it looked. We did have one go at getting out the back. I was swimming along and using all my best rough day swimming techniques. 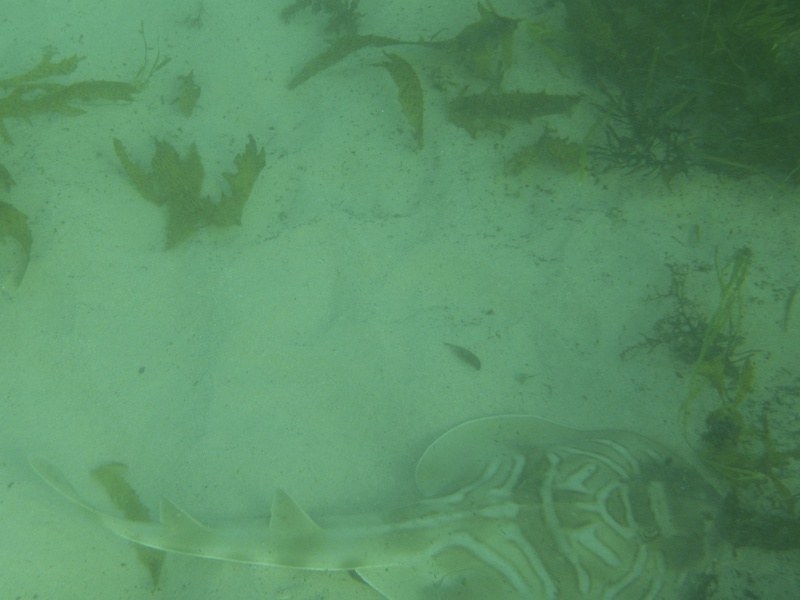 I was very focussed on getting under the big waves about the back (and it was pretty dark and scary underneath them!). 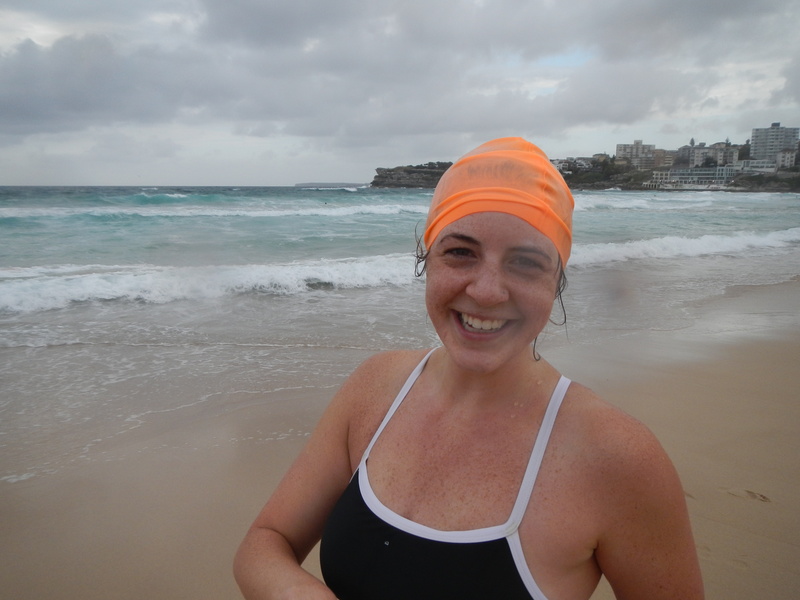 I’d assumed that I was following someone as usual, and was swimming Nicole who has swum the last 2 winters with me. At some point I stopped and turned to Nicole to check….was there anyone actually ahead of us??? As the waves were pretty big, it took a few sets for us to get a clear view up ahead and we realised that there actually wasn’t. For the first time, we were int he lead and responsible for deciding when was a good point to turn around…everyone was following us! At that point, an extra big set came in and the waves were looking really big! the first couple were OK and we turned and started making our way in. 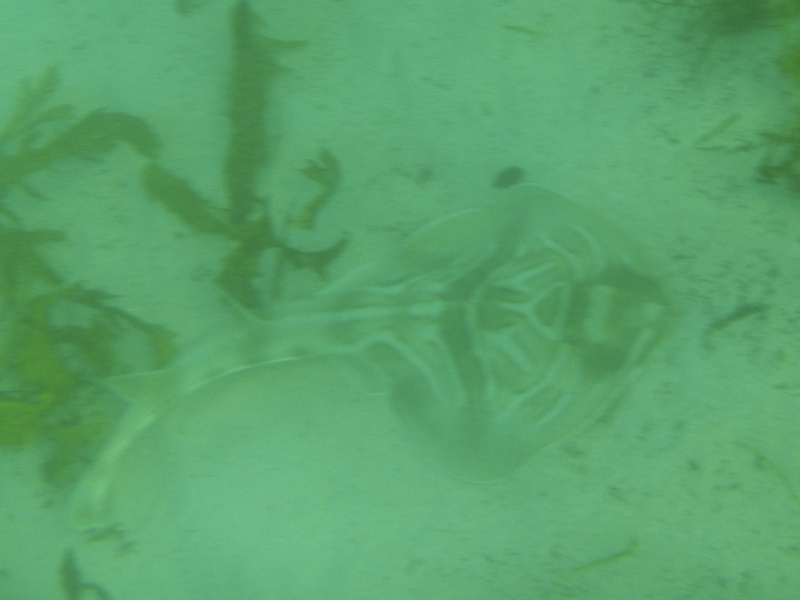 Then a really nasty one came along. I jumped on it, to catch a bit of a ride in, and realised it was a bit rough and tumble…and that there were a few people being knocked around in there. When we came up for air, one of our swimmers, Jessie…who was one of my mentees this year so it’s her first year swimming, had taken a bit of a knock. Nothing major, just been thrown around enough to give her a bit of a fright. We were still a fair way out so it was a bit of work to get back to the shore. Jessie, despite being a newer swimmer, did all the right things for the situation, and so did the swimmers around her. Firstly, Jessie didn’t panic. Well, she might have a little…but didn’t go into that panicky behaviour that can get you into worse trouble out there. Second, she let people know that she wasn’t feeling great…and gave them the opportunity to help her out. a bunch of swimmers stuck around to make sure she was comfortable and supported as we slowly swum in, and to give plenty of warning as new waves approached…there’s nothing worse, when you’re already still a bit shaky from a wave, than to get slammed all over again! The last thing Jessie did was to just keep swimming, She’s been doing this long enough now and is a good enough swimmer, to get herself out of trouble so long as she simply does what she’s been doing all along….swimming! It’s really that simple. I loved that when we got back to shore, I asked Jessie how she was and she shrugged it off…and pointed out where she’d gone wrong. She’s taken it on board as another experience and learned from her mistake. We all have the odd moment when we get a little frightened or unexpectedly knocked around. It’s your attitude and how you react, that determine how that works out in the end. The weather on Saturday was rough. Really rough. 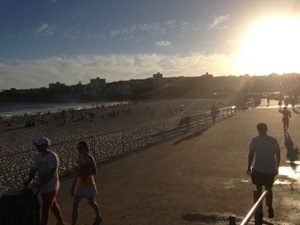 Oceanswims had made an early call on Friday afternoon to call off Sunday’s Bondi race. Very sad as they’d already postponed once before (meaning they weren’t able to be the Can Too Goal swim) due to issues with the council. 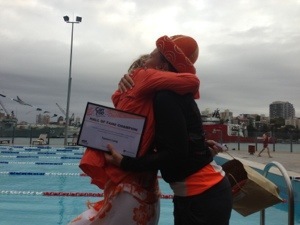 A lot of us Can Too swimmers were very keen to support this race, too, as funds go to Bondi Surf Club and it’s their volunteers who provide all those hours of water safety that are so essential to the program. So it was rough. And raining. That kind of rain that feels like needles on your skin. Of course we went swimming anyway. I did concede to the weather by driving instead of riding over in the morning, so it’s not like I completely ignored the inclement weather. It’s just that rough days are like a lot of things that seem hard until you actually do them. The water was a balmy 26 degrees and we did channel swims…not even trying to get out the back…which would have been a bit tricky since there really wasn’t any proper “out the back” to get to since there were waves and whitewater all the way out. 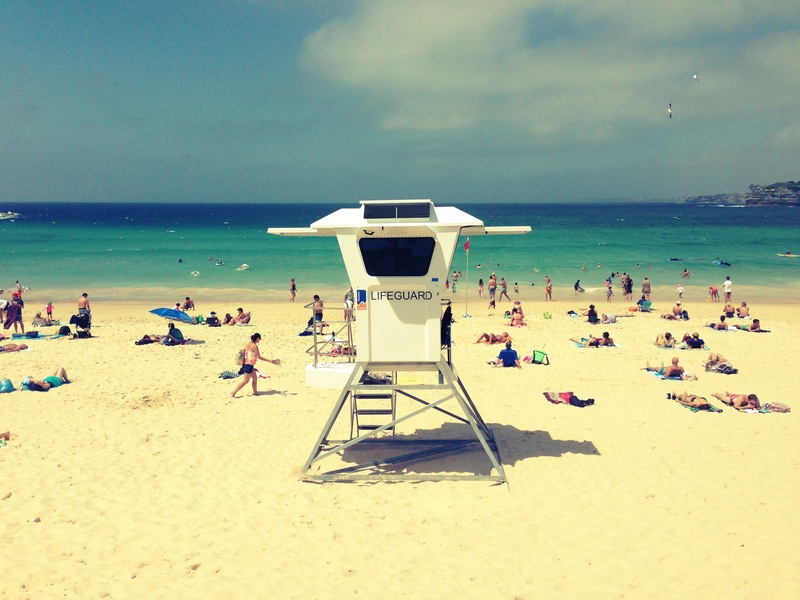 these sorts of days are actually great…if you prepare, front up and give it a go, the big secret is that these can be some of the most fun days you’ll have swimming (especially as you’ll likely have the beach to yourself!). You should definitely know your limits, but feel free to push them a bit. And next time there’s a bit of chop in a race situation, you’ll be well and truly prepared! I woke up on Sunday, and it could not have been brighter or better! After the…errr…challenging conditions at the first Can Too Goal swim at Palm Beach, it was brilliant to see the sun shining, the tiny shore breakers the only waves lapping at the beach, and the smiles more common than furrowed brows on the orange-clad sea of Can Too swimmers buzzing on the beach. As for the race, well the water was clear and the course was well marked. The main thing of note with the race was just how crowded it felt out there. In particular, in the 1km the wave start I was in was men and women 30-39. In a race this size that was a lot of people. It felt like you were swimming and being jostled the whole way along. I twas hard to overtake, and it felt like you were being pushed from all sides as faster swimmers passed. In the 2km this was slightly improved as they split the start group by gender, but it was still a big group. And it still felt super crowded out there. I’m normally a fan of not stretching the start times out too far (Cole Classic anyone?) so that the water safety people don’t have to be out there for hours, and people aren’t having to wait too long on the beach at the start and the end, but I did really feel this race went to the other extreme. Other than that, though, the races were great. 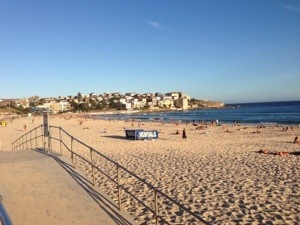 The water was clear and there was minimal swell. As usual for me lately, I got no joy out of the 1km race. I’ve just been working too much on distance to have any idea how to sprint…and it was never my strong point in the first place. I seem to also overthink it…worrying about whether I’m going too hard so I’ll lose it in the longer race and then worrying I’m going too slow and don’t need to. then somehow I do these completely rubbish times. The 2km, as usual for me lately, was a sheer delight. I felt good and strong and kept a fairly good line and came out with a PB for that distance even if you account for the fact that the course was a little short. 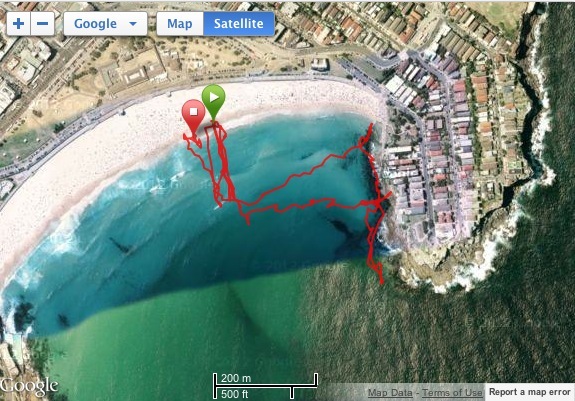 I’ve added the GPS maps for each race below…and thought it’d be interesting to add the 1km from a couple of weeks ago…just to show that a 1km course isn’t always the same thing…even at the same beach only a couple of weeks apart! All good things must come to an end. Apparently. Sad as it it, last Wednesday was the final training session for the 2012-13 swim groups, including the inaugural Andrew Boy Charleton pod. the good news is….we made it!!!! It has been such an immense pleasure sharing this amazing experience with my mentor group, friends old and new, my entire pod, and all the people who have come along on Saturdays to the Bondi sessions. It makes my heart so glad to see people come to love the sport that makes me so happy, and see them do and achieve amazing and challenging things. We did a bit of a training session, although a bit shorter than usual as we are officially on the “taper” now. And then the all important final event. A Relay! With Pool noodles! 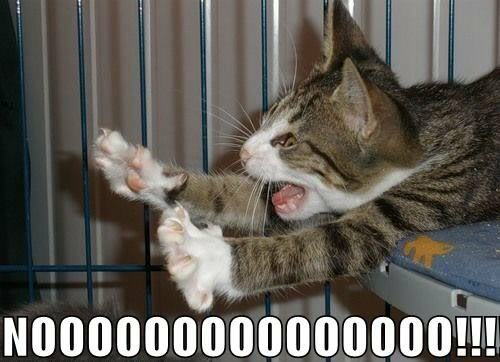 My only sadness for the day was that I’ve been having camera issues (yes, again…). There were some magnificent performances and techniques, although I’m going to go ahead and call it that the highlight was seeing Tri coach Gordo complete his leg doing butterfly! Thanks to all my amazing Can Too friends, this season has truly been a blessing and an amazing experience. I look forward to seeing you all at Bondi on the 10th…on for amny of you I hope you’ve caught the bug enough that I’ll see you at future sessions and races and beyond! After months of hard work it was time to make sure everyone had their swimmers to try out and get used to before their big events. That, and have an embarrassing photo! 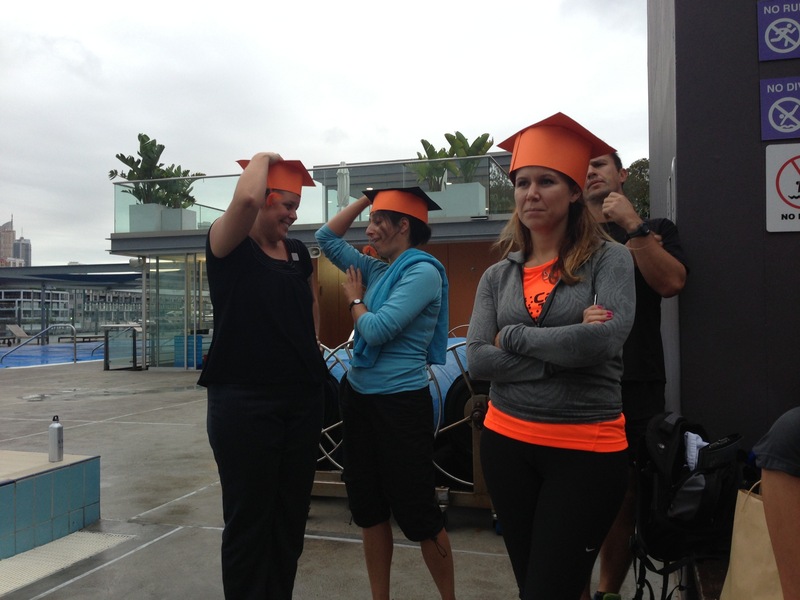 Not to be outdone, the mentors got to have photos wearing crazy hats! (Thanks to Captain Bel for the Arts and Crafts). Sadly the Wednesday weather curse threatened to send them off on their own adventure. We also had a very special guest. None other than Can Too founder, director and dead-set-legend, Annie Crawford, who has done so much for such a good cause, and is perfectly lovely to boot. Annie came along for a bunch of reasons, all of them good. One in particular stood out, though. The awesome and inspiring Tamera has been a participant in swim programs, a half marathon run program, a mentor, a team captain and now a coach for our wonderful premiere ABC pod. Just to add a little sugar, she’s a hero of mine for completing the Rottnest Island channel swim last year, embarking on the adventure of motherhood this year, and being just one of the nicest people you could meet. And she’s now raised $10,000 for cancer research. After a hot and steamy Friday night, the cool change was welcome. The big waves that come with it were a mixed blessing, though. 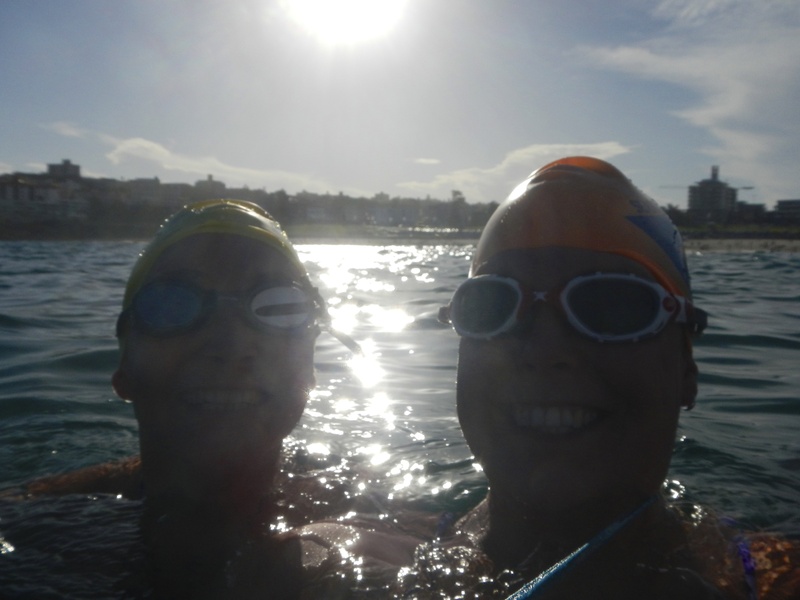 I did the early 4SEASons session before Can Too training, and after coming along to spectate at last week’s North Bondi Roughwater I had finally gotten my friend (and dive buddy!) Steph along to an ocean session. Talk about being thrown in at the deep end! It’s been smooth seas for a while now, and I think it was a shock to they system of a lot of the Can Too swimmers to find themselves in pretty big surf. Although it was tough and challenging, it was a really good chance to get back into those big surf skills – porpoising, getting under waves, swimming hard between the sets, and learning to judge the waves as they were coming at us fast and strong. 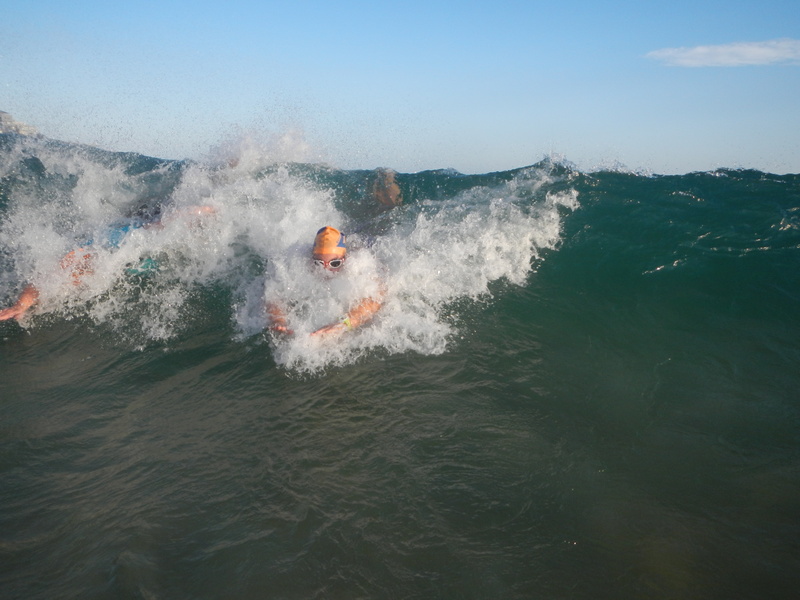 I personally love these conditions….lots of fun and bests of all is the body surfing! 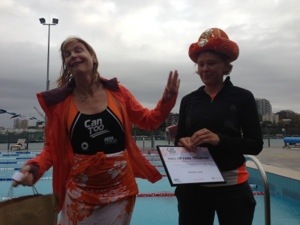 It did take me a long time to get there, though, plenty of winter Saturdays with Coach Kingy standing in the break giving instructions (mostly “Keep swimming!”) or literally holding my hand as I dived under the waves to give me a sense of when to go under and when to come back up. I know there were a lot of people there who found the big waves quite challenging, but one thing I know for sure is that dealing with that sort of surf is a skill you can learn like any other. It doesn’t have to come naturally, and in fact some of the best things to do when encountering these conditions are actually quite counter-intuitive. I’ve written about big waves before, and my favourite tips. Might be time for a bit of a review!